In the days before motion pictures and television, a large number of theatre troupes and vaudeville acts toured the country. In 1900, for example, 339 theatre companies were traveling from town to town across the United States. Frank Cotton built this theatre in 1909-1910, just as the popularity of traveling companies was starting to decline. The Cotton Theatre could accommodate about a thousand persons and was designed to accommodate the elaborate sets and scenery that were typical of the pre-World War I theatre. The dedication performance took place on June 23, 1910, when May Robson starred in a performance of The Rejuvenation of Aunt Mary. During the theatre's first season, more than 40 plays were performed here, including modern comedies as well as Shakespeare. It soon became clear, however, that Cedar Falls could not support a live theatre. Cotton sold out in 1913. 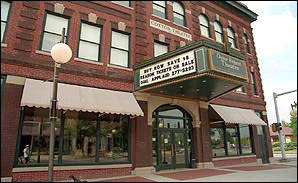 Subsequent owners also had trouble attracting an audience, due in part to competition from the Grand and Empress motion picture theatres in Cedar Falls. The Cotton Theatre changed hands several times before it too became a motion picture house, the Regent Theatre, in 1918. By that time the number of traveling companies in America had been reduced to just 41. The building has had extensive refurbishing. It is once again a “live” theatre. It is listed on the National Register of Historic Places.